Is there a Subaltern pedagogy & how does the field influence the instruction? 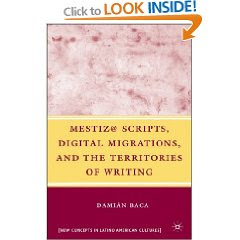 Borderlands & Subaltern rhetorician/scholar Damian Baca, author of Mestiz@ Scripts, Digital Migrations, and the Territories of Writing (New Concepts in Latino American Cultures) (summary & review) took some time to provide me with his perspective on pedagogy. Having had a distinct interest in post-colonial literature & criticism, I am curious about the field of how Subaltern studies would influence the pedagogical practices of those in the field. CM: I was wondering if there's a particular pedagogy that goes along with Subaltern Studies. Do you find yourself using a particular lens through which you approach teaching? DB: My own interpretation is an epistemological shift of placing the "subaltern" at the very center of intellectual and creative thought. Unlike others in rhet/comp, I apply this to both teaching *and* scholarly inquiry. Rhet/comp "writes about" the disenfranchised within U.S. borders, but they do not "think and write from" subaltern and hemispheric perspectives... Another reason has to do with the dominant Eurocentric pedagogy and history of the field... The field turns to "whitened" Greeks and Anglo-Saxon thinkers and Western European philosophers and Euro-American pedagogues. What if we flipped the script? What if we learned nothing at all about Western-Anglo civilization other than the literacy of poor white folks in Appalachian countrysides? And then spent the rest of our studies learning about Maya writing and Aztec philosophy and Chicano rhetorics and AfroCuban anthropology? This would require an epistemological shift of global proportions. CM:I spoke with other Borderlands rhetoricians who finds a feminist lens reoccurs in her different pedagogical practices. DB: For me, questions of classroom pedagogy are always linked to political commitment, ethical practice, and intellectual investment. In other words, pedagogy goes far deeper than "how do I teach my first-year students of color?" inquiries that dominate the field. Notice how nobody asks about a third-year pedagogy for students of color, or a pedagogy for first-year graduate students, or a "minority" graduate student's right to their own pedagogy?